Mirach said in a statement on Thursday, it is preparing ‘legal action against Sahara over issues such as breach of contract, defamation of character, amongst other deal related problems. In addition, the group is also preparing an official affidavit regarding the transaction with Sahara that will be sent to the apex court in India. The Subrata Roy-led Sahara group has accused Mirach of ‘cheating and forgery’ in the failed $2.05 billion loan arrangement and said it has initiated legal action against the US-based firm. Mirach's Indian-origin chief executive officer Saransh Sharma said "the allegations are frivolous, and are wasting time as the February 20 deadline approaches. A simple meta-data test and review of the evidence would dispel any notions of forged documents, prior to consuming the court’s valuable time with a lawsuit." "In an effort to end an unfounded, highly publicised defamation campaign, Mirach Capital Group is currently preparing an official Declaration of Facts Affidavit regarding the transaction with the Sahara Group, to be sent along with detailed evidence to the Honorable Supreme Court of India. Amidst allegations, Mirach's officers have recognised the recent legal efforts by Sahara as further attempts at scrambling to buy an extension when none is needed," the firm said. Accusing Roy of indulging in ‘game-playing’, Mirach said it is the ‘latest causality’ of the group's stall tactics and its officers affirm their belief they should be given the first opportunity to close the transaction. "Mirach further applauds the Honorable Supreme Court of India for its suggestion to explore a sale of Sahara's properties. "While Sahara claims to have additional prospects to replace the loan offer, over 28 previous attempts have failed, with Mirach being the latest causality of stall tactics, blame-shifting, and prideful unwillingness. Yet and still, Mirach's investors stand ready, willing, and able to make a purchase of the assets should the court intervene," the company said. 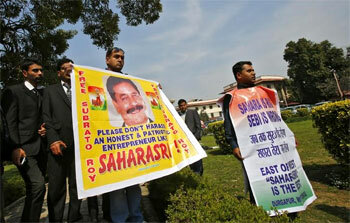 Mirach Capital had offered to help in Sahara's efforts to secure release of its jailed chief. The Court had given time till February 20 for the Sahara-Mirach deal, but the deal fell apart after Bank of America came out with a disclosure that it was not involved in the deal as was being claimed.